A young girl from a remote village in the Soviet Union, Sara had never dreamed that she possessed a hidden talent. A skill that couldn’t be taught, an inherent “stillness” that would mark her for greatness as World War II and the German invasion rolled across her homeland. Over time, her name would be spoken with both awe and fear, depending on which side of her rifle scope the speaker stood on. It’s with great sincerity and zero hesitation that I write this review on a book that will stand in my opinion as one of the best I’ve ever read, from a brand new publisher determined to set a standard. Usually for a review, I’ll read a book and then let it sit for a bit before I start typing, to think on what I liked and didn’t like about the comic and why. With the understanding that any opinion I have on a title is just that, one opinion among many, it’s always my intention to zero in on what worked for me rather than what didn’t. If I can’t really find enough “good” to overshadow the “not so good”, I just don’t write a review. I’m not a critic, I’m just a guy who never grew out of comics, who sees them as a medium every bit as legitimate as any form of printed word, and gets to talk about them (whether anyone’s actually listening or not). 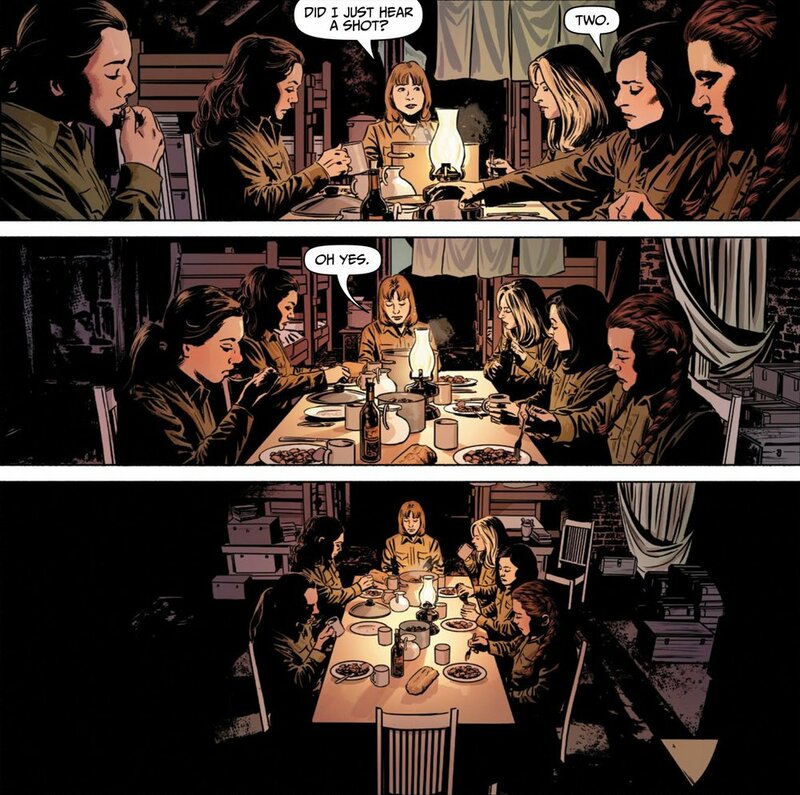 Comicbooks engage readers on multiple levels, both written and visual, and every once in a while we’re lucky enough to read one that we know is going to stick with us and be read over and over again. Sara is one of those. Most readers of comics won’t need to be introduced to writer Garth Ennis. His resume’ includes books such as Preacher, The Boys, The Punisher, Hitman, and War Stories, and his work has inspired no less than two television shows (Preacher on AMC, and The Boys now in production for Cinemax). 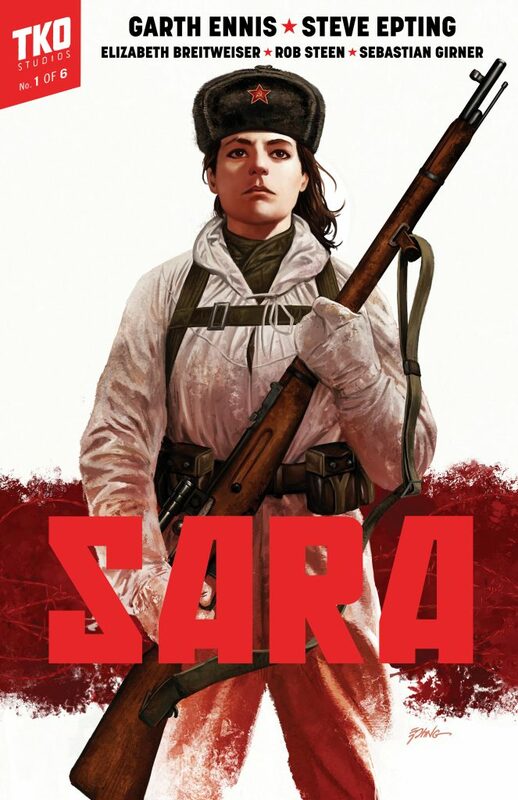 In Sara, Ennis takes another good look at the events of WWII, and brings the focus in on how those events impacted individuals. Sure, we’ve all heard inspiring quotes like “uncommon valor was a common virtue” and seen the inspiring image of Marines raising the American flag on Iwo Jima. But if you’d like to go a little deeper, pick up the book “Flag of Our Fathers” (also a major motion picture) and get to know those same Marines as individuals. 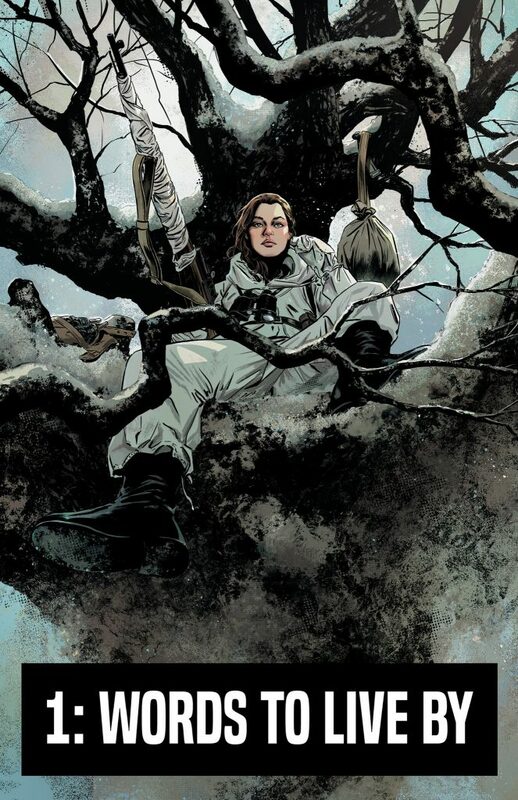 That’s one of the things Ennis does in Sara, bringing the focus in on a single person for whom the book is named. 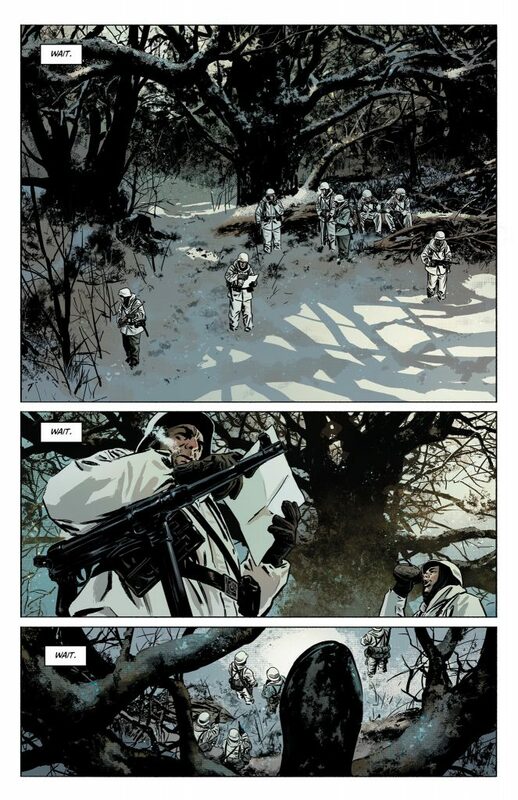 The other really cool thing that Ennis does is switching his focus from soldiers fighting for their country to people fighting for their homes in occupied territory. That many of those people were women fighting for “Mother Russia” is a part of history that often gets glossed over. During the Second World War, Communist Russia was on our side- or at the very least, they were very much against the Nazis invaders- and they committed all of their resources to the fight. That meant that anyone able to pick up a gun was brought into the service. In many cases women, every bit as displaced by Nazi occupation as the men, were trained to become some of the best snipers on record in the war. Ennis has brought the focus in on just such a unit of snipers, women from all walks of life, and the story he tells on their behalf is nothing short of outstanding. All pretty words aside, a comicbook is only worthy of the name if it has the artwork to go with it. On that front, Sara has an artist every bit as prolific as her writer. Steve Epting’s credits include pretty much every title holding a place in the pantheon of comics, including The Avengers, Superman, Aquaman, The X-Men, Fantastic Four, & Captain America (credited along with Ed Brubaker as the co-creator of The Winter Soldier). I don’t think that I can come up with anything to say that hasn’t already been said about the guy’s work. Epting invests every character on his page with something extra, as though he knows a little bit about the lives of everyone he draws, whether they appear on a dozen pages or in a single panel. He’s also able to communicate the tension of a sniper’s job, no easy task considering a sniper will spend several motionless hours waiting for a single target. It’s worth noting that one slow and steady pull of the sniper’s trigger is often immediately followed by complete chaos, and Epting conveys that with a great eye to detail and dynamic action. For all of the praise I’ve heaped onto the two obvious names involved in bringing Sara to the page, I still have to mention the great work done by Elizabeth Breitweiser (Batman, Outcast, Kill or Be Killed) & Rob Steen (Punisher, Nick Fury) . 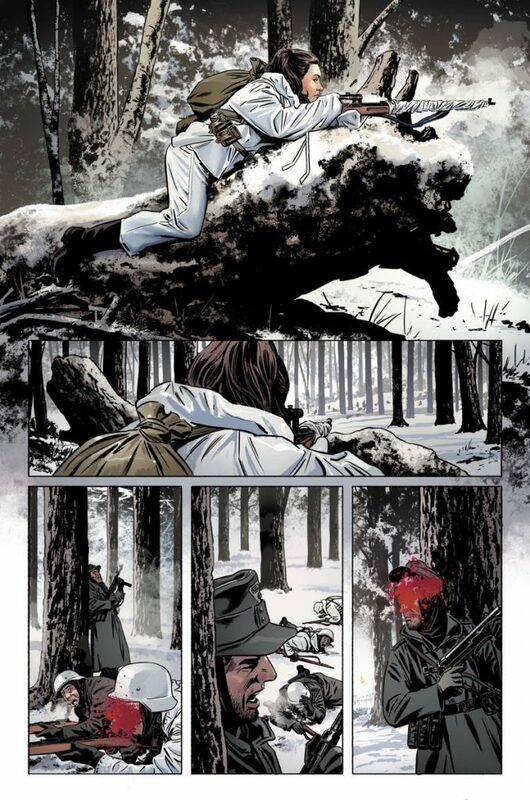 The snow covered landscape that makes up the vast majority of Sara’s environment might not give a colorist much to work with, but Breitweiser finds every opportunity to show her talent. Whether it’s found in the rosy, cold-touched cheeks of the characters, or the puff of red created by a long-range shot striking “center mass”, her work shines in the smaller details. The other, even more underappreciated artist in the comicbook medium is the letterer. If the lettering overshadows the art, gets in the way of pictures by going a little too far, it would follow that all really good letterers are doomed to go unnoticed. Rob Steen has walked a pretty fine line here, keeping his influence under the radar while finding creative ways to give voice to the often silent life of a sniper. Whether it’s in the sudden shouts in panic stricken German as troops come under fire, or in the slowly fading breath of the dying, Steen uses print to lay a subtle punctuation mark where it needs to be. So enough beating around the bush, I’m just gonna come out and say it… Sara is an outstanding piece of work that needs to be read. For that matter, TKO Publishing is an independent label that deserves some attention. For a company to offer readers a chance to binge read a title by releasing full arcs is pretty cool. Giving the choice of how to collect and/or read their books- single issues, trades, or digital downloads- is awesome. But TKO stands behind their product like no other publisher I know of, letting prospective followers read the first issue of all of their titles online for free instead of trying out a new series blind is crazy. And in my case at least, it worked. Sara for the win, by TKO in the first round.